Light, airy, bustling, and cosmopolitan, the Hotel Pulitzer is a sophisticated joint without a hint of pretention. There always seems to be something going on at the hotel as business types take casual meetings in the lobby and live DJs spin chill tunes on the roof. Modern art is displayed all over the hotel adding a sense of importance and the location is truly unbeatable as it’s a short walk from Plaça de Catalunya. The hotel has both scooter and bike rentals for 10 Euros per day. More modern art is splayed in the rooms which feature hardwood floors, balconies (in almost half), shutter-style headboards, and 100% Egyptian cotton sheets. Bottled water is complimentary and there are tea/coffee kettles in all rooms. If you want to bring your four-legged friend, you’re in luck! This hotel is pet-friendly and even provides a special doggy kit upon arrival. The fee is 25 Euros per night + a 50 Euro cleaning fee. Shower/tub combos or solo showers are wrapped in teal tiles while giant mirrors are framed with wood. Malin & Goetz products are standard. The ever-bustling lobby has light hardwood floors, large modern art pieces on the walls, mismatched furnishings and high-top tables. It’s the ideal space for casual meetings or just get-togethers after work or before a night out. There’s no pool, but hotel guests have access to the Holmes Place Fitness Center down the street, which has ample facilities. The fee is 15 Euros. There’s no spa, but the hotel offers a variety of in-room treatment options. Like the pool, guests can use the Holmes Place center to work out and also get access to their sauna and Jacuzzi for 15 Euros. The hotel also offers guests private yoga sessions either in the hotel or somewhere else in Barcelona for 80 Euros. The Greenhouse Restaurant lives up to its namesake as this naturally lit, foliage-filled space is open for breakfast and lunch serving locally sourced Mediterranean fare. 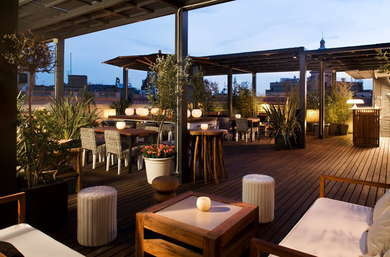 On the roof, the Pulitzer Terrace is a bumping bar scene that also serves a barbecue from Wednesday to Sunday. Specializing in vermouth, the bar also hosts DJs throughout the week that brings in locals and hotel guests alike. The Lobby Bar, meanwhile, is a more sophisticated watering hole with classic cocktails and tasty tapas. Practically next to Plaça de Catalunya, this hotel boasts a location that is literally in the center of everything. At the Plaça are multiple metro stations and bus stops and taxis are ever-present. Plaça de Catalunya is also at the top of Las Ramblas, the most trafficked pedestrian street, with dozens of attractions, bars, restaurants, and shops. The area is packed with people day and night – just watch out for pickpockets. Next door is sister Hotel Regina, which has a lovely coffee shop and café called La Esquina (1-minute walk), which also dishes out a great weekend brunch. If you head down Las Ramblas, you’ll come across La Boqueria (8-minute walk) a massive food market with more than 200 stalls and restaurants that’s sure to whet your appetite. Cocktail fans might want to check out Two Schmucks (7-minute walk), a fun and laid-back bar with expert mixologists. Another cocktail spot closer to the hotel is Boadas Cocteleria (3-minute walk) which just so happens to be the oldest in Barcelona. The Pulitzer is a sophisticated boutique that prides itself on not being too stuffy. They do this in lots of ways and you can see it the minute you arrive. The lobby is a meet-and-greet spot with a fun bar and tons of couches and tables that are ideal for hanging out, having meeting, or sharing a drink with a date. The roof is one of the more fun spots in town with DJs and live music throughout the week. While there’s no spa, gym, or pool, they offer alternatives that can sate your workout or relaxing needs. Pet friendly, great service, and a perfect location makes this hotel a can’t miss for any traveler on the go.